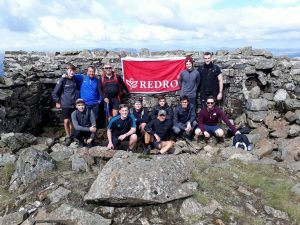 Redrow Homes continue to show support to their 2016/17 chosen charities as they complete Wales’s 3 Peaks Challenge, raising a total of £5,354.50 for Prostate Cancer UK. 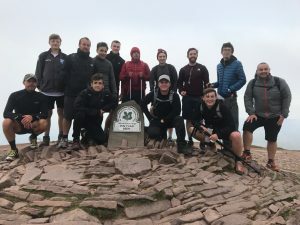 A team of 11 staff took on the gruelling challenge, which involved climbing Wales’s 3 highest mountains; Pen Y Fan, Cadair Idris and Snowdon in just one day. The team started at 4am and braved the cold autumnal weather to impressively summit all 3 peaks just after 8pm, walking a distance of 20.35 miles and ascending a total of 9,397 ft in the process. The majority of funds raised by Redrow were through the creation of a JustGiving page, which was set up solely for the event. Fundraising requests were primarily sent out to Redrow South Wales’s consultants and contractors, as well as staff and family members. Joe continued: “It was a comedy of errors from the very first training session. From Sean Halpin eating two Mars bars in ten minutes and falling ill, to Harrison Jones cutting his chin and the mini bus sat navs taking us in every wrong direction, we had an incredibly eventful day and one we’ll all remember for a while to come! James Beeby, Director of Fundraising at Prostate Cancer UK, said: “We’re incredibly grateful to Redrow and Joe for their triumphant efforts in completing the 3 Peaks Challenge and supporting Prostate Cancer UK. It is an incredible effort, one that will help us make prostate cancer a disease that the next generation of men need not fear.